January 27, 1907 - Lloyd's Weekly "the first man that started the work"
February 3, 1907 - Lloyd's Weekly VERY INTERESTING! For some months a new religious mission, the methods and teachings of which are more or less obscure, has been steadily at work in many of our country villages. 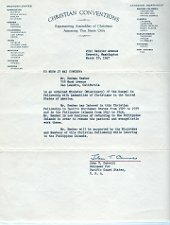 We would respectfully ask all ministers of religion and others really interested in religious efforts to make full inquiry and satisfy themselves of the genuine missionary character of certain parties of men and women who describe themselves as being of "No Sect," and having "no name," before giving them any encouragement. It is known that some 36 persons, mostly girls, have been sent away by these people, ostensibly for missionary purposes to foreign countries, and that requests for information as to their whereabouts, and the conditions under which they are living, have been refused. While making no charge, we wish to express our opinion that, unless full publicity is given to the movements of such companies of young persons, and proper supervision is provided, as in the case of the Church Army and Dr. Barnardo's emigrants, there must, whatever the ostensible purpose, always be a danger of some of them becoming the VICTIMS OF CIRCUMSTANCES and especially must this be the case when they are told to follow the Apostolic commission, "Provide neither gold, nor silver, nor brass in your purses, nor scrip for your journey, neither two coats,” etc. We would suggest that unless definite information be given as to the present condition of these young people, no encouragement or assistance be given to these professed missionaries. Geo. Allan, Vicar of Kenton. J. Haskell, Free Church Methodist minister, Framlingham. R. Abbay, Rector of Earl Soham. M. Allen, Vicar of Winston. Geo. W. Jones, Vicar of Tannington & Brundish. W. Batcock, Congregational minister, Debenham. Richard Newell, The Manse, Framlingham. F. D. Brown, Rector of Witnesham. E. F. Randolph, Vicar of Mendlesham. Geo. Cakebread, Congregational minister, Needham Market. C. Gale Rew, Vicar of Cretingham and Framsden. P. Rogers, Canon, Rector of St. Pancras Roman Catholic, Ipswich. C. B. Dundas, Vicar of Needham Market. ]. Davies, Vicar of Charsfield, & Letheringham. S. Stubbings, Primitive Methodist minister, Stowmarket. W. G. H. Ellison, officiating clergyman, Debenham. E. S. Finch, Vicar of Laxfield. H. A. Todd, Congregational minister, Framlingham. C. S. Flynn, Priest-in-charge, Stowmarket, Suffolk. J. F. Walker, Curate of St. Pancras Roman Catholic, Ipswich. A. H. McGachen, Rector of Monewden. About two years ago the village of Brundish, in Suffolk, was visited by a couple of women missioners, named Alice Pipe and Lily Reid. On an agricultural community, glad, perhaps, of a little colour in the monotony of life, they appear to have made a great impression. They condemned in violent terms the clergy of all denominations while lauding their own mission, founded, they said, on the lines of the tenth chapter of the Gospel according to St. Matthew. There were the usual “testimonies,” and several “converts” were made. Amongst them was Edith Easy, a teacher in the village school. So far the missioners seem to have worked on more or less common-place lines. When Miss Easy went home to Laxfield, about a couple of miles away, and told her father and mother of the mission at Brundish, no difficulty seems to have been placed in the way of her attendance. Soon, however, came an extraordinary change in her conduct. According to Mrs. Easy, whom I lately visited, she began to stay out late at night, owing to the protracted meetings in Brundish. Next she made it a practice to pay long visits to the missioners, and to devote much of her time to Miss Pipe, till one day she left school and told her astonished parents she intended to go to a “conference” at Belfast in the approaching June. At this time she was about 19 years old. The advice of her parents was disregarded. I was very pleased to get your letter, but am very sorry you are in such a worry about me. Of course, I can understand you can’t help thinking about me, but I have chosen this path and I could not turn back. It is not because it is easy, because this is the hardest life anyone could have, and I am assured it is the best life to live; if not down here, we shall get our reward when this life is over. If anyone wants to know how we live, tell them to read Matthew 10; that is how all the workers are sent forth, and some have now been in the work for five years and would not on any account go back to the old life, and that is how I feel. If I have to give my life, I mean to serve Jesus. The reason nobody wrote to you is because I came away on my own account, and when Mr. Cooney was in Suffolk he had a great deal to do. I expect some are coming back to Suffolk; if so, I daresay they will be round to see you. I think you could understand better, all of you, if you heard the truth preached. I have never heard it as I am hearing it now, and they are not men that get a large salary, but do it willingly for nothing, as they are directed in the Bible. I don’t know where you got the tale about the letters being read, as it is quite false; we are free to write to whom we like and when we like, and are free to go home if we like. They don’t want men and women, only those that have all their thoughts centred on Christ and the extension of His Kingdom; that is their one aim and object in life. One of the head men in this work was heir to all his father’s business and other money besides; but he was brought to see that riches will never save a man. So he gave it up, and is now one of the Tramp Preachers, and has never regretted it. Another man (the first man that started the work) was earning £6 a week, when he left it all and became poor for Christ’s sake, and if I was offered 1£ a week in some mission I would refuse it, because we are more like Jesus as we are without money. I am sure, dear mother, people will bring you all the tales they hear, and it is far better not to listen, because it will unsettle you, and you may be sure I am telling you the truth about it, and anything you want to know you can ask me. When I came to the work I said I would be willing to go anywhere the Lord wanted me, and there are a number of workers to go to America, South Africa, New Zealand, Canada, and Australia, and I am one to go to America. Dear Mother, I would have spared you this if I could, but it is no use going into the Lord’s work unless we are willing to go anywhere. You must remember I can’t go without suffering as well as you at home. My heart aches when I think of you getting this letter, but I am willing to go where the Lord wants me to, although it is to go to America. I only pray that you may get the truth around there. I am sure it would be very hard to work a mission in Laxfield, but I know that’s what is needed. I can’t write more now, but I hope I shall hear from you before we start. My fondest love to all. Good bye. Upon receipt of this letter Mr. and Mrs. Easy at once called a friend, and the following telegram was sent: Cooney Mission, Leadbetter Street, Belfast. Absolutely forbid my daughter Edith Easy, a minor, to leave United Kingdom. Wire agreement, or immediate proceedings follow. EASY. Sir, it is perfectly useless your getting my daughter to wire in response to my prepaid telegram to you that she accepts all responsibility. Someone must have found the money to get her to Belfast and to maintain her, and I ask you for the sake of my wife, who is seriously upset, to give me a definite answer to my request. I am quite willing as a compromise to give my consent to Edith staying with your mission on condition that you do not allow her to leave the United Kingdom. When she is 21 years of age I cannot, of course, help myself, but I cannot for the life of me see why, for the sake of helping my wife till the other children are older, she cannot stay here and let someone who is of age go to other countries. Cannot a change be effected? I am willing to stop all further proceedings if you wire acceptance of this request—surely a simple one. If her mother injures herself, the fault will lie solely at Edith’s door, for my request is so very simple and would not withdraw her from the work she appears to have set her mind on. Dear Edith—Unless you wish to kill your mother outright do agree to the compromise which, after much trouble, I have got your parents to consent to—viz., You can stay in the mission if you do not leave the United Kingdom. We arrived in Belfast the Sunday before August Bank holiday. The place of worship, or headquarters, of these people we found to be a disused builder’s yard and workshop in Leadbetter Street, off the Old Lodge Road. We started a fresh mission here this week, and whether it is a good sign or not the devil has tried in every way to stop us in getting a place to stay or preach, but we succeeded in getting an empty house that nobody will live in because a man was murdered in it. The Roman Catholics are terrible round here, but with God’s help we will endeavour to get something done for Him and His glory. I am with Miss Boyd now; don’t know if you will remember her. She is a Scotch worker, and we shall (D.V.) after this mission cross to Scotland. I would have rather stayed in Ireland, but I am willing to go wherever the Lord wants me. We are having good times here. Sixteen have professed and seem to be real for the Lord. Also a good many of the professing Christians seem to be willing for the truth; but, of course, the test will come. We have not given them very strong truth, but we are looking to the Lord to guide us how to speak the truth as it is in Jesus. The Faith Mission has a very strong hold on this village; so it is not so much the clergy to get them delivered from, but they have been so sickened with preachers and missions that have cost them three pounds a week. Many anxious months spent by the unhappy parents must be passed by in silence till we come to the first week in August of last year, when she paid what was to be a farewell visit to her father and mother, thus keeping her promise. She was then on the eve of her majority. With the law at her back the old protests and entreaties were more unavailing than ever. About the 7th of the month she left for South Africa by the SS. Wakool, but not without qualms of conscience, for in a letter written from Durban on Nov. 17, 1906, she says: I will never forget the last temptation the devil put before me the day I left home, and for a moment I know I wavered. Again: She (mother) seems in a terrible way about me. Mr. Wilson and a very nice clergyman were over the day after I left home, hoping to find me there and persuade me of my foolishness. On Dec. 1 she is still at Durban. To a girlfriend she says: Poor mother writes every week begging me to repent and come home. I believe the Lord is dealing with her. Edith (Edie) Easy is shown on the 1905 Workers List as entering the work in 1905. Quote probably referred to Ed Cooney: One of the head men in this work was heir to all his father’s business and other money besides; but he was brought to see that riches will never save a man. So he gave it up, and is not one of the Tramp Preachers, and has never regretted it. I found it a matter of considerable difficulty to identify the work of the mission with someone who would accept any kind of responsibility or general control. Eventually three names were brought under my notice: Wilson McClung, Edward Cooney and John Irvine. From the fact that the mission practises baptism by total immersion has come the designation “Dippers.” In the 10th chapter of the Gospel according to St. Matthew—which is the mission’s charter—occurs the phrase: “And as ye go preach, saying the Kingdom of Heaven is at hand.” Hence the name “Go Preachers,” and as missioners use a hymn-book called the “Go-Preachers Hymn Book, this is perhaps the most characteristic and comprehensive title. 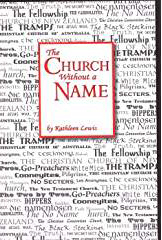 It has besides, the sanction of the workers, who sometimes vary the name by calling themselves “Tramp Preachers.” Strictly speaking, they decline to commit themselves officially to any name, on the ground that Christ Himself saw no necessity for a name or an organisation. 1892. William Irvine, colliery manager, “converted” by the Rev. John McNeil. Eight months afterwards resigned his position. 1892-4. Went to Bible Training Institute, Glasgow. 1895-8. Worked with the Faith Mission under J. G. Govan. 1899. Joined by John Long, a colporteur, and Albert Quinn, son of a Dublin shop-keeper. 1901. Edward Cooney, son of an Enniskillen draper, joined; later also, Annie Smith, one of his father’s assistants. “Today is my birthday. I am forty-four. To-morrow I celebrate another birthday. Fourteen years ago I was ‘born’ spiritually. “ -----(line missing)---mines about 1873, After years of hard work I rose to be manager for Messrs. W. Bearn (sic-should be Baird) & Co. at their Kilsyth and Bothwell pits, where I was employed when the Rev. John McNeil, the Evangelist, converted me, and eight months after his visit I gave up my position in order to devote my life to the Gospel, and I went to the Bible Training Institute in Glasgow. Had I chosen the ordinary path that leads to the ministry with its churches, chapels, congregations, and stipends, all would have been well. “But already I had realized that such things were not part of Christ’s ministry, and I decided to discard them. My studies finished I joined the Faith Mission, which was controlled by J. G. Govan, and I preached in various parts of the kingdom for something like five years. It was whilst I was working in the South of Ireland that I came to the conclusion that my positions was still inconsistent with the example set by Christ, and I left the mission to preach alone. “From that day to this day my methods have been the same, though I have learned a great deal. I take the Book as it is, relying for my provision in this world upon the promise of God, which you will find in Matt x.5-15. Whenever I have visited the home of a brother I have always found hospitality in exchange for that which, as a preacher of the truth, I bring into it. “And where I don’t pay for my shelter I leave behind as much as I receive. It is clearly laid down that the Apostles were to work with their hands, and wherever I go there is usually something to do, a bit of carpentering or a bicycle to mend. I can turn my hands to almost anything. We practice no cadging, no scheming, no flouting. In exchange for bread and butter , we give those who are in fellowship with us bread from Heaven—a real hearty exchange. My next inquiry had in view the astonishing celerity with which young, inexperienced, and illiterate converts become preachers. 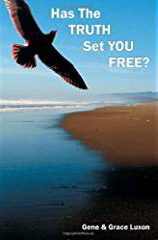 “No one is ever coerced into becoming a preacher. For that very reason I don’t see how it would be possible to interfere with a man or a woman who feels the call so strongly as to leave home. With such a system in use it will be agreed that the Go Preachers must be more or less products of their own system. At all events, I would like to point out that, even though a girl may command the advice, and possibly the assistance of the man or woman who “converted” her, that individual may be thousands of miles away. Clearly there is need here for something more than Biblical precedent. “The eye that mocketh at his father and despiseth to obey his mother, the ravens of the valley shall pick it out, and the young eagles shall eat it.” Text exhibited on the wall of the breakfast room in Mr. Wilson’s house. The Go Preachers have been located and___?___fixed as far as possible. Let us see what it produces. The fascination created by the new preaching. Her visits to the preachers. Her visit to the Belfast convention. The practical impossibility of reaching those responsible for her departure. Her announcement that she was one of those “chosen” for America. Her disregard for her parents’ wishes. Mr. W. D. Wilson may, perhaps be described as the largest and most important farmer in the country. He lives at Cretingham, which is about 12 miles from Ipswich. His wife is alive, as are his seven children: Edward Freeman 27; Emily 26; William Frederick 25; Ellie Elizabeth 24; Edith 23; John 22; Minnie 14. As in the Easy case, the Preachers were first brought under Mr. Wilson’s notice by a Miss Pipe, who wrote to Mr. Wilson in March, 1904, asking for the loan of the Cretingham school room. Developments were not slow to follow as maybe gathered from Miss Pipe’s own statement made to me at Ipswich. It should be compared with some of the chief features of the Easy case. “I knew the Wilsons whilst I was with Juby. On my return from one of the conventions I brought back May Carroll. We two started work at Monk Soham”—not far from Cretingham. “A short time afterwards Miss Carroll left and a girl named Annie Smith took her place. She, too, departed and I was joined by Lizzie Sergent. Afterwards the work in Cretingham was taken up by Annie Smith.” Here we have evidence of the usual gradual descent upon the little community. Mr. Irvine followed later. It now becomes necessary to go into certain domestic details concerning the Wilsons. I make no charges of any kinds against the Go Preachers. These details are necessary in order that Mr. Wilson’s position may be fully understood. Under the will of their grandfather, who died about fourteen years ago, each of Mr. Wilson’ children became entitled to a sum of £500, on coming of age. Like sums are available now, but have not been paid, and they will benefit further on the deaths of their grandmother and mother. John put his into the bank. May take a farm. Minnie’s is still held by the executors. Of these children Emily, Edith and Minnie are at home, in full sympathy with the Go Preachers, in whose ranks—at Christmas at all events—were to be found Ellie, William, Frederick and John, all of whom are away from home, though there was some suggestion that John might take one of his father’s farms. On Dec. 5, after declining to take any business, he made a summary request that his £500 share of his grandfather’s property should be handed over to him. Mr. Wilson assured me that it was a matter of congratulation to him that he had since been able to persuade Willie to lend the money to John. I left the story of Ellen Wilson at the point in 1905 which saw the departure of her brother William for the Belfast Convention. Mr. Wilson had been able to successfully oppose his daughter’s hopes of accompanying her brother, and domestic life at Cretingham dragged on to July, 1906. It will be good news to you to hear your father is gone mad. It’s no true religion. You have been there now three weeks, and you know very much against his wish. If you had any love for your father you write and say you are coming home. Every letter you write you agitate him, you know that. You will very repent, and bitterly, too. If you have any conscience in you at all. ‘tis downright wickedness to destroy your father’s life. On August 29, the convention being over, Miss Wilson was still in Ireland. Her father sent her £1 with which to buy a coat. On Nov. 17 he once more wrote suggesting that she should return and offering to send her a postal order or cheque. Two days afterwards Miss Wilson replied: Am not coming home. You know my intentions for being here and I must seek to go on and be about my Heavenly Father’s business. On Dec. 7 she says: I expect to be soon leaving here to start a mission with another worker. Will let you know my address so you needn’t trouble yourself about me. When I see an opportunity hope to come home for a few days to see you all, although it will not be at Christmas. In the meantime Mr. Wilson aggravated beyond measure by long months of trouble, went to an Ipswich blacksmith and had two crowbars made. Thus armed he went to the Go Preachers’ mission hut in Rushmere Road on Dec. 3. Without actually pulling the place down he wrecked the interior and was afterwards heavily fined. The Easy Case is Edie Easy who entered the work in 1905. Confirming the stories that are told about how early workers volunteered at conventions to carry the Gospel to other countries: "At the convention held annually in Belfast, brothers and sisters volunteer for the work in the Colonies, which is very much the same as the work here." When did this change to the workers being assigned to fields? “Every brother or sister is free to come and go at will. 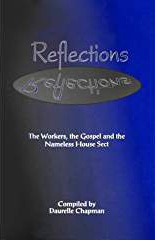 The workers go their own way preaching where they like, led thither and hither by the inspiration of the Spirit. No one is ‘sent’ anywhere." Wm. Irvine gives how long he preached with FM: “My studies finished I joined the Faith Mission, which was controlled by J. G. Govan, and I preached in various parts of the kingdom for something like five years." "Free Press" of Dublin, Wexford & Waterford. The devil can quote scripture for his own purpose, and according to some letters and leaflets we have received there are people going about England garbed in religion and calling themselves "Evangelists," who are animated by the most vile objects. As soon as they are got out there, I fear they are sold to the highest bidder, or else forced to keep with these horrid bands of hypocritical miscreants whom it is my most earnest desire to expose and bring to justice. These wretches carry with them portable chapels, which they erect in important centres, thus gaining influence through an outward appearance of respectability." Mr. Wilson then details some changes in the law which he considers necessary, and the paper concluded with the advice—“Keep this for Ever for future re ference against Masquer­aders of Ministers of Religion." N.B.—Pray without ceasing—Deliver us from evil—Because your adversary the devil goeth about like a roaring lion seeking whom he may devour—I would, thou, wert hot or cold. With a view of hindering this Rabid Extortation of Girls to a Secret (?) Home under cover of the Church. Chairman of the School Board. August 4th, 1905: 36 Workers Shipped to America. August 4th, 1906: 4 Accounted For. August 4th, 1907: 32 Unaccounted For. Where are the 32? What are the 32? Are the 32 safely kept? Are the 32 home coming? What are these 32 or being used for!!! The annual convention of those who are popularly known as Pilgrims or Cooneyites, and who style themselves ‘Tramp preachers,’ is at present being held at Crocknacrieve, the residence of Mr. John West, within a mile of Ballinamallard. The convention, which met last week will continue for a month. At present there are about 600 in conference, and more are expected to arrive during the coming week. To cater for and find sleeping accommodation for such a large concourse of people is no small undertaking. For a month previous to the meeting of the convention, arrangements were being made for their habitation. Crocknacrieve is a large house, with many spacious rooms, and its roof at present cover 200 women and children. Most of the rooms are at present bedrooms having over an average four double beds each. The beds are mostly made on the floor and in some instances three occupy the same bed, some rooms are occupied solely by mothers and their children. The large stable loft, which has been the scene of many meetings in the past, is now converted into one large dormitory for women, in which there are about 60 beds and with a few exceptions all are double beds. The men, excepting those far advanced in years, sleep out in large marquee tents of which there are seven. 70 are accommodated at Mullaghmeen and 50 at Ballinamallard. The cuisine arrangements are complete in every detail. Two large boilers are constantly in use for cooking. The old wine cellar is turned into a bakehouse and on last Saturday as many as 160 loaves were baked by two members of the convention who were old soldiers and had served their country at home and abroad. The meat for use is brought from Belfast and it is not a question of ordering a sirloin or round, but whole carcases. Those of the ‘tramps’ who understand butter-making are busy in the dairy where a separator is kept in use. Practically every trade is represented at the Convention. There are mechanics, tailors, dressmakers, joiners, carpenters, cobblers, tiresmiths, and even a watchmaker is there with his tools and bench and is kept busy doing repairs. Most of the ‘tramps’ have bicycles, and to enter one of the spacious lofts where the machines are kept one would imagine they were looking into a store of some large Coventry cycle warehouse. It would be impossible to describe fully all that has been done for the comfort of the visitors, but even to a writing room and a post box for letters, a hospital for the sick, are they provided with. Each day of the week (including Sunday) three services are held in the large tent on the west side of the house. The first is in the morning from 11 a.m. till 1 p.m., then another is held in the afternoon from 3 p.m. till 5 p.m., and the evening service lasts from 7 p.m. till 9:30 p.m. On last Sunday at the afternoon and evening services fully 1,000 people were present. The men and women according to the old Jewish custom sit apart from one another and do not mingle. Their dress is plain. The women mostly wear black skirts, cotton blouses and sailor hats. The male attire does not in any way vary except that in some cases no collars or ties are worn. To look upon the vast gathering one would wonder where they all came from. There are English, Scotch and Irish. Some come from the Far East and some from the wild West. There are even half-caste Indians from North America there. They all formerly belonged to all sects and creeds—not only Protestants, but some had been members of the Greek and Roman Churches. Two of their number were Ministers, and Suffolkshire is represented by no fewer than 30 souls. At last Sunday evening’s service there were five men and two women on the platform, and of the former were two of the chief pioneers of the movement—Mr. Wm. Irwin and Mr. Edward Cooney. The meeting opened with the singing of hymns and prayer. The most interesting address was that of Mr. Wm. Irwin, who dealt solely with the clergy and the terrors of hell. The others did not practically touch either of those subjects. Mr. Irwin is a forcible speaker, and has a very convincing manner. He spoke of the clergy of all denominations in scathing terms and stated that in all ages the clergy were the marks of the devil. Jesus, he said, would never have a clergyman, and his own personal belief was that every clergyman would go to hell unless he turned and worked in what he called ‘the Jesus way.’ He also added—‘No one in heaven believes in the clergy, and no one in hell either.’ His idea of hell is rather novel. He described it thus:—‘Hell is a place where every man will be made to serve God in the Jesus way.’ Mr. Cooney gave a short address. In the course of his remarks he made the momentous announcement—‘We believe this is the last message to the people of Fermanagh.’ He also referred to their sect as ‘God’s saints and servants.’ At the close of his remarks he called on those who were saved since the beginning of the convention to stand up and remain standing, the idea being to confess God openly as their Saviour. Seven did so. Mr. Cooney also requested those who had not been publicly baptised, and wished to be, to stand up. Nineteen signified their wish. A baptismal service was then announced for next Sunday. JOHN WESLEY ‘A LIAR’ THE POPE IS CALLED A DEVIL AT HEART. The ‘tramp preachers’ to the number of 600 have continued in conference for the past week at Crocknacrieve. Of this 600 there are about 300 workers, the other 300 being ‘saints’ and ‘bishops.’ The conference is lasting for a month and the workers remain all this time at the conference. The saints and bishops come and go. It has been estimated that up till the end of last week 2,000 of the latter had attended the convention and left again, for their home. As many as 70 arrived on last Saturday night from one place alone. During the week, services are regularly held and are attended largely, as many as 1,000 being present at the Sunday evening services. On an average about eight hours are spent each day in worship, and as many as seven addresses have been given at one service. Although the ‘tramps’ boast of no leaders, no secretaries, &c., still they have their appointments in other departments. In the large farmyard is posted up the list of those who supervise in the kitchen, the dairy, the post office, and the hospital. The man told off to look after the bed accommodation, those who cook, shave, hair dress, and tailor, those who repair boots and cycles, the authorities on railway communications, those appointed to watch over the houses where bicycles are stored; the names of all those men and women are posted up. Discipline is carried out more strictly than one would imagine. It appears that some of the ‘tramps’ (both men and women) had been guilty of talking at night after retiring to rest to the discomfiture of others. The matter was reported to Mr. Wm. Irwin, and at an evening meeting last week he announced that if any one in future talked after going to bed, that person’s name would be given to him next day and publicly mentioned, and arrangements made for his or her departure. Like every other sect the ‘tramps’ have their back sliders and recalcitrant workers. One of their workers, J.L., [John Long] was accused of loafing for the past 12 months instead of working zealously and bringing converts to the ‘Jesus way’ of living. His ideas, evidently, were not far-fetched enough for his chiefs. At one of the services the suspected ‘loafer’ was called forth to give an address, and in the course of that address J.L. [John Long] spoke of the Ark of Noah. What was in it and not in it? There was no tobacco or pipes in it, he said. The speaker was interrupted by Mr. Irwin, who said to him ‘Say there were no clergy in it.’ ‘No, there were no clergy in it, ‘ quietly remarked the speaker. ‘Say it strong’ commanded Mr. Irwin in his gruff tone. But the speaker did not repeat it. It is understood that J.L. [John Long] was given notice to quit and left on Tuesday last. Mr. Edward Cooney was the principal speaker on Saturday evening last. He read the 2nd chapter of Revelations and gave his interpretation of each verse as he read it. He spoke of the seven churches of Christ and said that God was not interested in the Salvation Army, in the Methodist or Roman Catholic churches. He was only interested in the churches in the New Testament—churches formed by angels or messengers. The only one who could form a church was in the right hand of Christ and was ever willing to do His will in His way. That was why John Wesley was not a messenger of Christ, John Wesley never put himself in the right hand of Christ. People say times have changed. Jesus had been most particular that all sent in the early days should not be greater than He. Now they had the Salvation Army, the clergymen and the evangelists, who were all sent by the Devil, for Jesus never changed. Some people have often asked why they had no organisation. They had none, said Mr. Cooney, because organisation was of the Devil. Why no secretaries, no committees, no directors in the Lord’s work? WHY HAD THEY NO LEADERS? Because, they all were of the Devil. Jesus, himself, was their captain and guide. Every church formed had Jesus for its bishop and inspector. Jesus removed those unfaithful to him and encouraged those who were faithful. Having referred to the preaching of John the Baptist and those who were his followers and called themselves Johnites, Mr. Cooney said that those who called themselves Irwinites or Cooneyites were all going to Hell, for John had preached that they might be Christians and not Johnites. Those men had stopped short and had not understood the preaching of John. He (Mr. Cooney) had a reputation for kicking up rows, but he was always comforted when he read about Paul who went through the country districts and towns and got them turned upside down. If anyone tried to persuade them that John Wesley was an Apostle of Jesus, he could not. Why? Because they believed in the ‘Jesus way.’ If they tried John Wesley by Jesus, that what he declared himself—the sent one of Jesus, they found he was a liar, because he was not according to the pattern of Jesus, who was the pattern of the Apostles. In conclusion, Mr. Cooney made reference to baptism. They got baptized by total immersion in water as a public confession that they belonged to Jesus. To illustrate that the speaker said that when a girl wished to get married she first of all told the man of her choice, and afterwards made a public confession of her choice, by being publicly married at a registry office. A registry office was the proper place to get married. Clergymen could not marry. The Apostles never married any one and never would. Giving in marriage was the civil right of a representative of King Edward VII —a magistrate..
At the conclusion of the morning service on last Sunday morning the ‘Tramps’ celebrated Holy Communion. The service was quaint. There was no bright silver chalice for the wine, or was the bread cut in small pieces and neatly arranged on a silver paten. No one presided at the ceremony. The ‘Tramps’ sat in the large tent where they dine and hold their meetings. Thanks having been offered up by Mr. Edward Cooney, bread was handed round by men workers (women workers never take any part in the ceremony except to receive Communion) to those present. A loaf is cut into six parts, and one of these parts is given to each row. The first person receiving the bread breaks off a small piece and eats it, passing on the bread to the next, who also breaks off a piece and hands it on to his neighbour, and so on. After the bread has thus been passed round and eaten, the wine is sent round. The wine is in ordinary earthenware jugs and is poured into mugs which are then handed round. There was no singing at the ceremony. No one spoke or made a sound while the bread and wine were being passed round..
Before the afternoon service was begun several converts were baptised by total immersion. The Baptismal Font is the ladies’ bathing place. A stream runs along the valley at the north-east side of the house, and a large hole was dug out and a dam placed at the lower side, the water filling the hole and making a small pond. The depth of the pond is about four feet, and as there were 27 to be baptised, two of the workers performed the ceremony of immersing the converts in the water, so that a considerable amount of time was saved. One convert was of such dimensions that it took two men to put her under water. After the ceremony, an open air service was held, and an address was given by a worker who was an old soldier. Unfortunately he could not be satisfied with himself unless he indulged in some abuse of the clergy. The Pope, he said, was a devil at heart, the clergymen were always servants of the Devil. Continuing, the speaker said that the better they stood in their attitude towards men, the worse they stood towards God. It was sad that they had one in their midst who had a smack of the clergy. He had seen Christian fanatics in the east lie on spikes for days, sit on ashes day and night, and hang by a spike from the flesh in the back. They all go down to Hell blindfolded. It had been asked where did they all go before the teachings of William Irwin or Edward Cooney. Where did the proposing Christians go? Do you mean that they have gone to a lost eternity? ‘They have all,’ said the speaker, ‘gone to Hell, every single one of them unless they were born again, or else God Almighty is a liar and they are his dupes.’ . THE DOCTRINE OF THE REFORMATION. An interval in the service was made at half-past five, when tea was served to all present. At half-past six the service was resumed, and Mr. Edward Cooney was the principal speaker. He made a number of personal references to his youth and to occurrences which had warned him against a lost eternity. Mr. Cooney also spoke on John the Baptist and his Gospel. The Methodist Gospel, he said, would land them all in Hell. The Gospel of the Roman Catholic, Presbyterian, or Episcopalian Churches would land them in Hell. The only Gospel that would land them in Heaven was the Gospel of Jesus, the Apostles’ Gospel. What was the Gospel of the Presbyterians, Methodists, &c. Here it is—give up smoking, drinking, swearing, dancing, theatre-going, novel reading, &c. Some go further than others. And while they preach that men should give up all those sins, they allow two of the most damnable and devilish sins in the eyes of God. John the Baptist put his two fingers on those two sins—love of money and pride. The proud man was surer of going to Hell than the harlot. Love of money would send them far faster to Hell than the love of whisky. He never met a man or woman who loved his neighbour as himself till he got into fellowship with the ‘Tramp Preachers.’ The ‘Tramp Preachers’ demonstrate it in their flesh. John said if a man hath two coats, give one away. The Sunday Suits were of the Devil. If they preached that in Enniskillen Methodist Church, the people there would say they were dafted. He preached it at a convention at Keswick, and a prominent evangelist shouted ‘humbug’ at him. After Mr. Cooney had finished speaking, a Miss May Carroll spoke and the meeting concluded with the usual call on converts to confess their conversion by standing up publicly. Altogether the ‘Tramps’ were continually at service from 10 a.m. that morning till 9:30 p.m., excepting two hours interval for meals. Mr. Edward Cooney left Crocknacrieve on Monday with two companions for the Keswick convention. Mr. Cooney was at Keswick last year and held meetings and denounced the clergy. At the meetings there were many interruptions, and it is anticipated that there will be a recurrence of last year’s scenes. The convention has still another week’s work before it, and before it closes it is expected there will be another baptismal service. Between 60 and 70 workers have volunteered for foreign lands, and up to 50 have entered the work. A remarkable religious convention has just concluded near Enniskillen, county Fermanagh. One thousand three hundred pilgrims, or Cooneyites, last Sunday assembled at Crocknacrieve House, Ballinamallard, the residence of Mr. John West, a leading member of the Pilgrims. The convention was mooted some months ago, but no person believed for a moment that it would have assumed such huge dimensions. Representatives were present from the Far East, America, Australia, India, South Africa, England, Wales and Scotland. Hundreds of spectators visited Crocknacrieve, and when the devotional part of the programme commenced there was a mass of humanity such as had never before been seen in that part of County Fermanagh. Two entire days, meal hours excepted, were devoted to prayer, preaching, and the singing of hymns. August 1, 1907, p. 5 THE IMPARTIAL REPORTER Established 1808. Newspaper for Enniskillen, Northern Ireland _____________ EVANGELISTS INTERRUPT A MEETING A BELFAST MAN’S TESTIMONY. On next Sunday the ‘Pilgrim’ Convention at Crocknacrieve will close. It has been the largest Convention yet held by that body of believers, towards the end of last week up to 700 being in conference. Since the congress began, beautiful weather favoured the ‘tramps,’ and their stay at Crocknacrieve has been quite a holiday. Outside hours of devotional duty, the ‘tramps’ have enjoyed themselves. Numbers cycle through the country, and some visit friends. Bathing is the order of the day, the men making full use of the Ballycassidy River, while the women use a pond specially dug out for them beside a stream. In this pond the baptisms take place. It was expected that Mr. Edward Cooney, who returned on Sunday from the Keswick Convention, would have made some mention of his doing there. He only made a few references to what happened, and in that the public were generally disappointed. He only made a few passing references to incidents that happened while on his journey to Keswick and his stay there. He spoke outside the Convention Hall there, and was, he stated, interrupted several times by clergy. Some evening services are quite given up to converts giving their testimonies. To judge by their accent, they come from all parts of the Kingdom. There is no mistaking the Scotch, who are on the average very eloquent, the words flowing from them with apparent ease. A large number of them come from Dundee, and in their testimonies it appears the majority of them were Sunday School teachers and office bearers in the Church. One Belfast man in his testimony was very bitter against the clergy. He had been a member of the Church of Ireland, but now if a clergyman visited him he turned him out if he be not walking according to his light. He also made the following remarkable statement:— ‘I believe the clergy think they are doing the will of God if they put one of Christ’s faithful followers to death.’ One very interesting testimony was that of a Miss Power, from County Wicklow, who stated she had been a Roman Catholic, and had attended the meetings conducted by the ‘tramps’ secretly. Night after night she went to the meetings, eventually deciding to leave her Church, people and home, and become a ‘tramp.’ She is now out on mission work. CLERGY WERE NOT ALL WRONG. A discussion then followed between the Evangelist and Mr. Irwin. That same evening another Evangelist, while different ‘tramps’ were leading in prayer, prayed aloud. He began his prayer in the usual way, and then prayed something to this effect—‘I understand, O Lord, there are some going from this place, be with them; some going to foreign countries, O Lord, be with them. Lord forgive where we think that some men have spoken wrongly today—said things that we cannot agree with.’ At this stage Mr. William Gill, a ‘tramp,’ rose from his knees and asked the Evangelist to cease preaching. It was prayer time, and they wanted no preaching at that time. Still the Evangelist insisted with his prayer, when Mr. William Carroll came to the rescue, and began singing a hymn, which was taken up by those present, the Evangelist being visibly quite upset by this ruse. 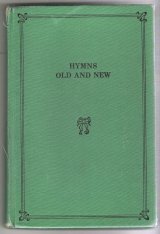 After the hymn was sung he was told that if he could not conduct himself to withdraw from the meeting. But the strangest thing of all is that they stayed on in Crocknacrieve a few days, and were the recipients of hospitality and lodging. There has been very little of public interest at the meetings during the past week. Most of the addresses were dry, and lacking spirit, Mr. William Irwin and Mr. Cooney are always listened to with interest, but they are exceptions. One evening, when speaking of the destruction of Sodom and Gomorrah, Mr. Irwin referred to the terrible earthquake which wrecked San Francisco. He had arrived, he said, in San Francisco one beautiful night at 10 o’clock, and having finished certain correspondence retired to rest, when about 3 a.m. next morning he was suddenly awakened and found himself thrown out of bed. He hastily dressed and went out, and saw more than perhaps any one else did. Why he saw more than any one else was because he had no person to be uneasy about—no property, no money, and no interest to lose. It was a sight he could never forget. More real and vivid still had God portrayed to him the terrible doom of Sodom and Gomorrah. Dean of Clohger (sic—should be Clogher) Attacked. The Convention of Tramp 'preachers,' which has been in progress for the past four weeks, concluded on last Sunday. Some of those attending the conference left there on Sunday evening, and some on Monday morning. The Convention has been the largest yet held by that sect, and it is stated that they are pleased with the success which it has attained, and the number of fresh converts it has won over to the Jesus way' of living and believing. On Sunday last there was a very large attendance, and as a fare­well bomb MR. EDWARD COONEY delivered an address, in which he referred to the local clergy and their wives in scathing terms. He did n ot stop at common type personalities, but out of respect to them we do not publish his remarks. He made no distinction between the clergy of one sect or another. The Pope came in for his share, as did also the Very Rev. the Dean of Clogher. A baptism took place during the afternoon, at which a large number of visitors attended out of curiosity. The " Dippers" and their Ways. The "Dippers" sect, which has created so much noise and amusement in the North of Ireland, has been holding a Con ference of preachers at Crocknacrieve, Fermanagh. This is the spot where the new creed was founded some three years ago. Then they numbered but eight or ten, to-day they claim to have half a million followers. In the meantime they have spread to nearly every shire in England, to Scotland, Australia, Canada, most of the English Colonies, whilst there are not less than 120 of the “Go- Preachers"—as they term themselves—at work in the United States. The gathering in Fermanagh was unique in some respects. The preachers assert that they carry no money and possess no funds. Yet on a certain day they were enabled to arrive at Ballinamallard, literally, from the four winds of the earth. Over six hundred of the brethren were there for three weeks, whilst the visitors, some of them adherents, many mere sight seers, numbered occasionally as many as a thousand. Yet there was food enough and accommodation enough for all, women and children. Everybody was entertained. Some of the preachers assert that it was little short of a miracle how they were enabled to feed so many. "God provided us amply," one of them said, "because we have infinite faith." One sympath iser sent five tons of flour, another forwarded a carcase of meat twice a week, a third gave a large quantity of butter, a fourth gave 26 cows to supply milk. 'These people possess no churches, they have no centre, no head. Everybody is equal with the other. They collect no money, carry no "scrip," relying upon the generosity of the faithful to supple their needs. The outward profession of conversion is the public baptism, from which ceremony the preachers have been termed "Dippers." They call themselves the "Go Preachers." The place selected for the baptism is usually a river. The brethren assemble on the banks and sing hymns and preach. One of the elders wades out into the stream until he is immersed above the waist. Then come the converts, one by one. Placing one hand upon the back and the other upon the forehad (sic), the brother officiating tilts the convert backwards until he or she is completely under the water. The ordeal is more trying than it may appear, especially if the weather be cold. Hundreds of curious people congregate to witness the scene, they come long distances by bike and car. As each convert is thus publicly initiated into the faith, the preachers sing the hymn: "WHO'LL BE NEXT?" One might feel inclined under ordinary circumstances to laugh at such a ceremony. But the surroundings do not conduce to mirth. The grave thoughtful faces of the bearded preachers standing about, the more animated, but not less rapt, looks of the women, awe one into silence. The men slept in tents in the grounds of a big farmhouse belonging to one of their followers, the women and children occupied the rooms in the house and the barns. There was room enough, and food enough for everyone who came. The place resembled nothing more than an army camp. The farm­yard square was filled of people: everywhere the brethren could be easily recognised by their unshaven beards, rubber collars, and coarse clothing. The buildings on one side were given over to the commissariat, baker turned out large currant loaves, sisters and brothers joined in the cooking. The orders of the day were posted up who was to do the milking, the washing, the butter-making, and the serving. Three were detailed for duty in the bicycle-shed, where as many as 800 machines were to be seen at times. All the "Dippers" cycle; it is the cheapest manner in which they can get about, and the least expensive. Everyone who came was welcome, and all were invited to the meals. Upon long benches in the outer tent, where the services were held, the food was served up. Mugs, minus handles, were the vessels supplied, and jam-jars. And whilst each visitor (and many of these were mere sightseers) was given a separate vessel, the brethren were enjoined to use but one mug for two. This they did cheerfully. One could not help being impressed by their self-denial and sincerity. They have Elders, Overseers, Deacons, and "Bishops," "and," said Mr. Irvine, one of the leaders, "they do not labour for filthy lucre." In all their sermons a note of antagonism to the churches is manifest; it is almost the keynote to the creed. They quote Luke the 6th to show their divine commission. They are poor, with no certain dwelling place. Mr. Edward Cooney, who may be said to be the founder of the " Dippers," possesses a strong individuality. The son of a wealthy trader, he gave away all his money four years ago, resigned his business, and went out to preach a veritable pauper. "My friends cast me off,” he said; "they would not notice me in my poor clothing. Newspapers reviled me, vile slanders were spoken of me, dastardly charges were made against my character. They hurt me but I had His example to guide me, so I put them on the one side." Sometimes, as at Newtownards, Co. Down, he and those with him were obliged to lie for nights by the sides of the ditches; no one would give them a shelter owing to their preaching against the churches. In Glasgow he has been in jail for persisting in obstructing the thoroughfare by gathering crowds. In Suffolk his tent was smashed up by an irate county gentleman who had become enraged at his daughter and son leaving him to follow the "Dippers." Edward Cooney has been stoned in many places, laughed at and jeered and beaten, but he keeps on, and his supporters daily grow in numbers. The "Dippers" are recruited from all classes and creeds. Some of them are people of position and education; the mass, however, are of the working or artisan class. A Miss Barton, a member of an old Fermanagh County family , told one evening how she had given up her fine dresses and money, and ease, and her horses in order to go out and preach the Gospel. Often times one of these people will start out penniless unknowing his or her destiny. As a matter of fact they seldom have any money. When the beggar asked Christ for alms he replied "Gold and silver have I none." Many of the "Dippers" could make a similar reply to-day. They have no Sunday clothes; if they find a second suit they either give it away or sell it. A second shirt they do carry as a necessity. When the Conference ended, the preachers spread to the ends of the earth. SIDE OF THE GRAVE AGAIN. To Canada some have set out, others to Australia, to the different shires of England, to the mining districts of Scotland, even to the far-away British Colonies. No man knows where the next year's Conference is to meet. Wherever it be, the brethren are certain to find money enough to pay their fares across the seas. They are in no doubt upon that score. C.H. Note: There were two Barton sisters in the work, Penny and Susie. Mildred Penelope Matilda Barton (Penny) was born April 25, 1885 in Pettigo, Co. Fermanagh. Penny was the 8th child, and her sister, Susan Cecile Grace Barton (Susie) was born December 24, 1886 in Pettigo, Co. Fermanagh. Susie was the 9th child of Captain Charles Robert Barton and Henrietta Martha Mervyn Richardson. These two women were members of the Landed Gentry (the gentry who own land--considered as a class) (http://www.thePeerage.com) . It is said that the Barton girls played with Queen Victoria's children. The Barton's of The Waterfoot in Pettigo, Co. Fermanagh have a long history in Ireland, England and France. However Penny left the work and on August 27, 1918, she married Simon Christopher Loane, a cattle dealer. They had four sons. Penny died August 6, 1971. Susie was a sister worker until she died March 2, 1968. Penny left the fellowship and her children were not brought up in it. No one else in the Barton family professed. In 1921, John and Sara West sold the property conventions had been held on for a number of years at Crocknacrieve in Ballinamallard to Simon and Penelope (Penny Barton) Loane, parents of the late Warren Loane, and his wife is the current property owner. A meeting of a very peculiar, very unpleasant and happily of a very unusual character took place in the Minor Townhall, Enniskillen, on Monday evening [Sept 23, 1907]. The proceedings in fact were altogether of an extraordinary description. Every person in this district is now acquainted with the sect of people known as “Dippers,” “Pilgrims,” or “Go Preachers,” as they are severally called and with the doctrines held and preached with such earnest zeal by the leaders and followers of that sect. It has remained, however, for Mr. W. D. Wilson, chairman of the School Board, and of the parish meeting of Cretingham, Framlingham, Suffolk, England to put a new, and, need we add, an altogether unfounded and imaginary interpretation upon the aims, objects, and purposes of this much criticized religious body. Mr. Wilson has two daughters and a son who attended meetings held by some “Go Preachers” in Suffolk, with the result that they became convinced that these people were right in their interpretation of the Gospel, and that the doctrines they propounded were in accordance with scriptural teaching, and consequently they determined to throw in their lot with them. This they did and left their home to go preaching and spreading the new beliefs and theories with which they had themselves become imbued. From that time their father started a crusade against the whole sect known as Go Preachers or Pilgrims and has issued a large quantity of literature denouncing them in no measured terms, and accusing the leaders of all sorts of corrupt, immoral and scandalous objects. Being a gentleman of means, owning over 2,000 acres of land in Suffolk, he is able to spend a good deal of his time and money on his propaganda, and as the Pilgrims have such a large following in Fermanagh and the adjoining counties it was not surprising to find him coming over here to denounce them. He had no supporters of any denomination on his platform on Monday evening. From the outset it was manifest that the proceedings were going to be of a lively nature and lively they certainly were. The audience was a heterogeneous collection of people comprising members of all our local churches, Presbyterians, Methodists, Church of Ireland, and a very large proportion of Roman Catholics. Five-sixths of these were young fellows who had come simply on the chance of a “racket,” and the amount of cheering and laughter that went on would assuredly have been more seemly at a music hall entertainment than at a nominally religious meeting. The levity displayed in dealing with sacred and Biblical subjects was sometimes bordering on the sacrilegious. Seated in the front row were Mr. John West, Mr. W. H. West, and other prominent members of the Pilgrim community in this district who had apparently come to hear the charges made against their sect, and to answer these if necessary. Early in the afternoon, we understand, a representation was made to the police authorities by a local magistrate that there might be a disturbance at this meeting, and a couple of policemen occupied places in the rear of the hall ready for eventualities. Fortunately, their services were not required. Mr. Wilson went on to say that the doctrines preached by these missioners were calculated to, and in fact did, induce certain young girls to leave their parents’ homes and associate with these missioners. After a short period spent in what was given out to be a preparation at a training home for future mission work, these girls have been shipped to China, South Africa and other foreign lands, and their parents had in some cases lost all means of communication with their children. These parents are in many cases illiterate persons, who have neither the means nor the knowledge requisite to enable them to take steps to protect their daughters from the anticipated evil results of their withdrawal from their homes by these missioners. It is gravely feared that these missioners are employing their so-called mission as a cloak for recruiting the ranks of the “white slave” traffic in foreign parts, because the children whose absences has resulted from the preaching of these missioners are many of them illiterate and totally unfitted for the mission work alleged by these missioners to be their object. When Mr. Wilson had read several other extracts from his booklet, Mr. W. H. West rose in the front of the hall and said that no person should take this seriously. He had been going about making these cruel diabolical charges against people because his two daughters and his son had happened to get “saved,” and were now preaching the Gospel. Mr. Wilson—Where is my daughter preaching the Gospel? Mr. John West—In Great Britain, and we can give you her address in the course of a few days if you like. Mr. W. H. West said this man had come to Enniskillen that morning, and he had got out a most ridiculous and abominable pamphlet behind their back, and he had brought the most foul and filthy charges of women stealing against a body of respectable people. If there was one iota of truth in this man’s statements they would be worthy of the hottest hell. It was not necessary for him (Mr. West) in the town of Enniskillen to defend the character of those who had been identified with them, those who had sold all and gone out to preach the gospel. He defied Mr. Wilson to give the name and address of a single man or woman belonging to the Pilgrims who had been guilty of any of the foul and filthy acts with which they had been charged. A man who would come there and be guilty of reading a rigmarole like this against their friends; their fellow countrymen and their brothers and sisters, accusing them of being women stealers, was not worthy of being heard by an Enniskillen audience. When Mr. West had concluded, Mr. Wilson who was standing in the middle of the room, asked was there any other gentlemen who would like to speak. A Mr. Carroll, another Pilgrim, also spoke and said he denied absolutely if there was any need for doing so, the charges that had been made there that night. Mr. W. H. West—None of your nonsense. None of your humbug or blarney. Just give us the names. Mr. Wilson asked where was a certain girl whose name was mentioned. Mr. W. H. West—Whom do you accuse of stealing her? That is the point. You are a coward. You dare not give a name. “In Philadelphia.” “In New Zealand.” “In Australia.” “In South Africa.” And so on. Mr. John West—Give the reporters the names of the men who stole these girls. After further discussion, Mr. Wilson said the Pilgrims had not read their Bibles. They had read parts of them, but all ministers of religion should read all the Bible from beginning to end. He then quoted some passages, which he said the Pilgrims, whom he described as hypocrites, had not read. Mr. W. H. West—Give us the names of these people. None of your acting. (Hear, hear.) When he has been cornered, he feigns madness to keep clear of the law. Mr. W. H. West—Mr. Wilson we cannot stay much longer. Mr. Wilson—Do not be in a hurry. Let us thresh this matter out. I came 200 or 300 miles to do so. Mr. W. H. West said Mr. Wilson had made certain specific charges of the gravest character against their fellow countrymen which he had utterly failed to prove. They would give him another chance to mention a single name before they left the hall. Mr. Jeffers, Enniskillen, then made some remarks after which the Pilgrims rose to leave the hall. Mr. Wilson here took off his glasses and shaking them at the audience, called on them to block the door, and not to let the people go away. The Pilgrims, however, left the hall, and shortly afterwards, Mr. Wilson finished his address. His proposed petition to the Lord Primate only received one vote. Considerable interest was aroused in Enniskillen on Monday last, when handbills were circulated announcing that a public meeting would be held in the Townhall, ‘In reference to the invasion of women thieves from America,’ and also that the meeting would be addressed by Mr. W. D. Wilson, of Cretingham, Framlingham, Suffolk who has for some time been conducting an ‘anti-Coonyite’ mission. Toward eight o’clock, the time for the meeting, the Minor-hall was only partly filled, and when the meeting commenced it was about three-quarter full. Some prominent townsmen were present as well as a number of ‘pilgrims,’ including Messrs. J. West, W. H. West, R. J. Lendrum, J. Jeffers, Wm. Carroll, J. Humphreys, and Miss Forde. Our country is invaded by corrupt women from America set to work to ruin others by American wrecking adversaries with American money unlimited, taking them away, bidding every person defianse to an unknown (?) home for a questionable (?) purpose, to a questionable (?) home for an unknown (?) purpose. Keeping polygamy and women stealing, quite out of sight, this side of the water. I would suggest a petition should be sent to our Primate to set a Sunday apart to set them as a gazingstock to warn the public to refrain from these men to cease helping these men who are vagrant, seductive ‘Go Preachers of No-Sect Sect,’ and worse and worse, Anti-Religionists, bar Jesus and Anti-Christs. re Mormonites and other Sects. Will the Government request and insist on strict and detailed registration of all girls and young women at all ports of embarkation and at all ports of entry, with a view of enabling parents to protect and track their lost children. 1. In the autumn of the year 1904 certain women and men ostensibly describing themselves as missioners visited our district with the object of making converts to Christianity and of obtaining helpers in mission work to be carried on in China, America and other parts beyond the seas. 3. The doctrines preached by these missioners were circulated to and in fact did induce certain young girls to leave their parents homes and associate with these missioners. After a short period spent in what was given out to be a preparation at a training home for future mission work these girls have been shipped to China, South Africa, and other foreign parts, and in other cases fear to lose all means of communication with their children. 4. These parents are in many cases illiterate persons who have neither the means nor the knowledge required to enable them to take steps to protect their daughters from the anticipated evil results of their withdrawal from their homes by these missioners. 5. It is gravely feared that these missioners are employing their so-called mission as a cloak for recruiting the ranks of the ‘white slave’ traffic in foreign parts because the children whose absence has resulted from the preaching of these missioners are many of them illiterate and totally unfitted for the mission work alleged by these missioners to by their object and because these missioners have chiefly required young females for their purpose the few males who have also followed these missioners were employed, it is believed as a cloak to cover the underlying motive of the mission. During the reading of portion of the pamphlet. Mr. Wilson then continued reading the pamphlet, and when he had concluded, he remarked that there was a great deal more to read but he would let the gentleman come on the platform and hear what he had to say. Mr. Wm. West then rose and said that the speaker had made diabolical and outrageous charges against people who they all knew. Mr. Wilson had three daughters and two sons, who happened to be serving as teachers and preachers in this country. Mr. Wilson (jumping to his feet)—Where is she? Mr. John West—We can give you the address in a few days. Mr. Wilson—I want it tonight. WORTHY OF THE HOTTEST HELL. he has brought on that platform. I am ashamed to be here. He has a daughter and a son preaching, and he brings a charge of mormonising against his own daughter, Eddy Cooney, Tom Betty, and Nat Dickson—faithful men and all well known in Enniskillen. We do not expect you all to agree with us, but you know they are honest respectable men. I say again it is a scandal for a man to come here and make such statements. We defy him again to give a name. Mr. Wilson—That is a terrible great speech. (Laughter.) Is there any other gentleman who would like to speak? Mr. William Carroll, another ‘Pilgrim,’ also addressed the meeting, and stated that the names and addresses of any one in the work could be given within 14 days at most, no matter what part of the world they were in. Mr. Wilson—thank you, gentlemen, for your addresses. Is there anyone else? No one rose to speak. Mr. Wilson—I can give you the names of girls who were lost. Mr. Wilson—I—G—, a motherless, fatherless girl. Where is she? Mr. Wilson—I don’t accuse anyone because you are double-tongued. Mr. Wm. West—You are cornered and beaten. I again challenge you to give the name. Mr. Wilson—Where is a A— P—, a motherless and fatherless girl? Mr. John West—What is your own daughter’s name? Mr. Wilson—I should think you ought to know that—(laughter)—and I will thank you to tell me where she is. Mr. John West—In a week’s time. Mr. Wilson—I want to know tonight. Mr. Wilson—Where is May Carroll? Mr. Wm. Carroll—I am her brother. She is at present in Fleet Street, Philadelphia. I had a letter from her two days ago. Mr. Wilson—Where is the other girl? Where is Alice Smith?—Tasmania at present. Where is Alice Muir? Where is Minnie Church? Where is Henry Church? Mr. Wilson asked for the names of the eleven girls who visited Cretingham before anyone knew there was a man behind them. He also asked for the names of the 25 persons baptised on Good Friday, 1906, near Ipswich. Mr. John West—We are waiting on the name of the man you accuse of stealing them. Mr. Wilson—They have more than one name. Mr. Wm. West—You’ll not, BECAUSE YOU ARE A COWARD. Give us any one name they go under. Mr. Wm. West—Give us any one name and then we will believe in you. Come on, you must give a name. Mr. Wilson—I want the names of the 91 persons whom you dragged off the correct path unto the crooked path. Mr. John West—We want the name of the man who stole these girls. Mr. John West—Give it to the reporters. Mr. John West—Was that right or wrong? Mr. John West—Was that a good thing or a bad thing? Mr. Wilson—I want the names to interview them. Give us one. I don’t know them. Mr. J. West—Did Wm. Irwin ever visit your house. Mr. Wilson—I do not know, for they have more names than one. Mr. Wm. West—He has made bad charges and now he is trying to get out of the whole thing. Mr. Wilson—Let me address you. You have not read your Bibles, you have only read part of them. You should read all of it. This is what you did not read: ‘Some preach Christ through strife and envy, and some through good-will.’ You are preaching through strife, allow me to tell you. There will be in heaven members of the Church of England, and Salvation Army, Roman Catholics will be there, and I will be there. (Loud cheers.) You will not be there unless God in His mercy knock you down as He did Saul of Tarsus, and when you are lying on the road, sprawling, astonished, you will cry out: ‘Oh Lord, what shall I do to be saved?’ That is the only chance for you, you old hypocrites. (Loud cheers.) There are a lot of other things in the Bible you do not read. I will get my Bible and tell you. Mr. Wilson then went to his bag to get his Bible, but not being able to open it asked would any person oblige him. Mr. Wm. West, thereupon, handed him up a Bible. Mr. Wm. West—Give us the name of the man you accuse of stealing women. Mr. Wilson (at the top of his voice)—You are double-tongued. Mr. Wm. West—You are acting the mad man to get out of it. Mr. Wm. West—Will you allow me for one minute? Mr. Wilson—Don’t be in any hurry we came here to thrash this thing out. We must thrash it out. (Prolonged cheering.) I came two or three hundred miles. (To the crowd at door) Lock the door and do not let them out. Mr. Wm. West—We don’t believe that any one would believe what this man states. He makes specific charges of the grossest character. He accuses their brothers and sisters of Mormonism and then feigns madness. He refuses to give the name when asked for in order that we might punish him. and it is a shame for an Enniskillen audience to listen to him. I challenge him to give one name, and if he does not we will have to go. Mr. Wm. West—He is not half as bad as he pretends to be. Mr. Jeffers here rose and said he believed Jesus was on trial that night. He asked them not to listen to that fool. Mr. Wilson (as the Tramps were rising to leave)—Don’t let them out; keep them in. (Cheers and boohs.) Lock the door and do not let them out. Some people at this stage began to leave the hall, and Mr. Wilson seeing this began to close the meeting. He said he was much obliged for the attention he had received, but he wished to have a petition sent to the primate to have a Sunday set apart to hold those folks up as a gazing stock. He then called on the meeting, which was getting gradually smaller, to voice its sentiment, and on the call for a show of hands, only six persons amidst laughter voted for the petition. Mr. Wilson’s pamphlets were then put up for sale at one penny each. One leading merchant of Enniskillen approached the table to buy a copy when Mr. Wilson, handing him a number of the booklets, and told him to take them round the room and sell them. The gentleman in question threw down the books with a look of disgust and walked out. Some others bought books and the meeting came to a conclusion. To Mr. W. D. Wilson, Farmer, of Cretingham. It is simply amazing that any Bench of Magistrates could be found in the twentieth century to fine you £5 for dealing out rough-and-ready justice to one of the sanctimonious, oily-tongued scoundrels who go about wrecking British homes in the name of religion. This precious "Saint" and "Bishop" was one Samuel Cole, a farmer, like (and yet unlike) yourself. If he is a sample of the "Go-Preachers," the sooner he acts up to his title the better. The sympathies of every mother and father will go out to you. To bring two innocent young girls up to womanhood, and then to have them enticed away by a hollow mockery of religion would almost excuse murder, let alone "threatening and breaking windows." He refused to tell you where your daughters were, except that they "had gone out preaching, according to the Scriptures." I trust he will find his accusation against you—"You are a persecutor of the Saints"—­ true in substance and in fact. The earth will be all the better when such vermin are cleared off it. Yours does not seem to be the only family which has suffered, as I learn other homes have been broken up in the district by this fanatical mob. If there are not enough sturdy arms in Suffolk to deal out a receipt in full for that £5 fine in the proper quarters, then I pity Suffolk. What with Agapaemonists, Mormons, Go-Preachers, Shakers, and all the rest of the hideous crowds of sensual sneaks, it is time we had a Gospel of Manhood. Would you like to borrow my whip? Thomas Elliott,who describes himself as a "tramp preacher," applied at Maghera felt Quarter Sessions for £12 compensation for the malicious burning of a Gospel Hall at Ballyroguley, near Moneymore, on July 5th last. Elliott, who belongs to County Fermanagh , has had several such halls built for his missionary work, the one in question being of corrugated iron. William Browne, BalIyroguley, stated that on the evening of July 5th there was a stove lighted in the hall to make tea for the visitors, but none came, and conse­quently the tea was "off" (laughter). When service was over the fire had burned out, and at 11 p.m. all was right. Next day he heard that the hall and furniture had been burned. On a previous occasion the hall, which was a moveable one, had been overturned. To Mr. M’Guckin (who appeared for the Maghersfelt Rural Council)—Two ladies lived in the hall when meetings were being held, but on the night of the fire they were not there. The “tramp preachers” carried no swords, but went on the principle of Matthew X (laughter). The local clergy and most of their congregations were not a bit fond of the “tramp preachers.” The clergy would not give up their salaries and snug houses, and go out on the lines of the “tramps” (laughter). Mr. M’Guckin—But the clergy would hardly wreck your little hall. Whoever overturned it might do it for a joke. Witness said he didn’t see “the joke.” There was only four of a “congregation” on the night of the fire. Thomas Elliott, the claimant, said he built the hall at his own expense, £12, including fixtures. It had no tiles or hearth fixtures. John Barryman swore he was one of the “congregation” on the night preceding the fire. One night when stones were thrown at the hall someone had “taken liberties” with his (witness’s) beard. Mr. M’Guckin—Except the clergy, who amongst the people would interfere with the hall?—Some of them do not like it, and the clergy are as tight as any of them (laughter). If I had called that night, would I have got a cup of tea?—If you had believed in us—yes (laughter). We would have lifted the can and gone to the well for water (laughter). Acting Sargeant, Walden, R.I.C., swore that the hall could not have been fired from the outside, as there was no timber there. His Honor (Deputy Recorder Bourke) refused the application as there was no proof of malice.